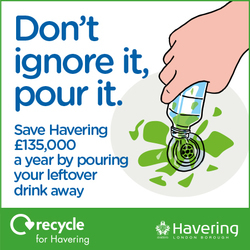 Havering Council spends nearly £15m a year disposing of waste and it's going up by £1m a year which is why it’s so important that everyone plays their part in reducing waste, preventing litter and keeping our borough clean and safe. Lent is here and for many people it’s an opportunity to try to give up bad habits. This year, rather than cutting out chocolate or curbing the coffee habit, we’re encouraging you to give up something else instead: putting food in the bin. Why? Because in the UK, 70% of all food thrown away comes from our homes. That’s more than 7 million tonnes of food and drink every year, the majority of which could have been eaten, shared and enjoyed. Buying only what we need and using up all of what we buy is a great way to keep food out of the bin and honour the lent tradition of self-discipline and restraint. By doing this you could be saving up to £50 a month each and our collective impact helps to protect our environment and the land on which our delicious food is grown. Explore our food saving facts throughout March 2017. 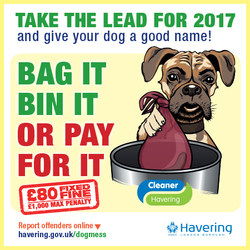 To request a place email sue.brown@havering.gov.uk. Workshop places will be booked on a first come, first served basis. Have you got money sitting in your London Green Points Account? If you're registered for the London Green Points-Havering free residents reward scheme you will be getting points credited to your account every three months, or more often if you have attended a workshop to help reduce waste or purchased a compost bin or real nappies sample pack. These points are converted into money which can be spent in the online store, transferred into a shopping voucher, or donated to a local charity that is registered to the scheme. The money is yours, it’s free and all you need to do is spend it! To sign into your account or to join the London Green Points-Havering scheme click below. 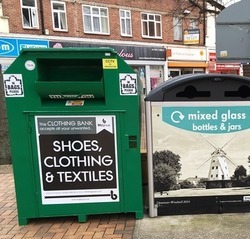 The textile collection service from recycling bring banks in various locations around the borough has been improved to collect a variety of extra materials and items. In addition to clothes, the banks now accept sheets, towels, curtains, duvets/quilts, pillows, handbags/belts, shoes, bric-a-brac and DVDs/CDs. Please note that all items must be dry and clean.To find your nearest textile bring bank click below. 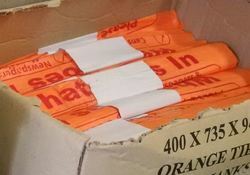 Rolls of orange sacks are delivered to all households every 13 weeks. If you haven't received a roll to your door for over three months then please contact Shanks on 0800 389 9918. Trying to prevent waste from occurring altogether is best, but not always possible, so please try to recycle as much as you can. Apart from the obvious items that are typically put in the orange sacks, there are many other items around our homes that can go into the sacks which may get missed, otherwise known as ‘the Unusual Suspects’*. For lots of examples of those ‘unusual suspect’ household items visit www.recyclenow.com. Watch this short video demonstrating the domestic rubbish and recycling collection service, delivered by Serco Environmental Services for Havering Council, to find out what happens to your waste. 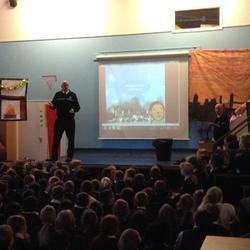 Havering Parks Constabulary concluded their Parks Protection Road Show season of school visits this month. They went to 24 primary schools and talked to more than 4,500 children over the last five months. The aim of the visits was to encourage respect and to persuade young children to use our parks to get fresh air and exercise, keeping safe and healthy, and looking after the green spaces they use. Activities included a section on the damage caused by littering and the health risks of dog fouling. It's hoped that this longer term interactive educational approach will reap positive benefits in years to come as the children are encouraged help to look after the many greens spaces and facilities we are lucky enough to have in Havering. Since the commencement of the road show in 2012 graffiti in play areas has reduced and it is hoped that the road show, along with regular policing of these sites, will mean this can be maintained in the future. Don't put full or half empty bottles in your rubbish or recycling sacks. Please pour any leftover drinks down the sink and then put your plastic bottle in your orange recycling sack or take your glass bottle to one of our many recycling bring bank sites around the borough. 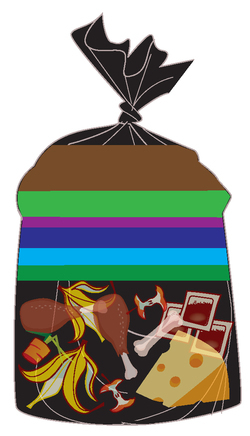 Around 40% of black bag rubbish in Havering is food. We mainly throw away food because we either cook too much or don’t eat it in time. It's easy to avoid this happening and by doing so you could save yourself up to £50 a month. Measuring the correct portions of food rather than guessing will keep the waste to a minimum and if you do have some left over then why not turn it into another dish the next day or have it for lunch. To make sure food is eaten in time, just keep your eye on the ‘Use By’ date and if you don’t think you are going to use it in time then put it in the freezer to be saved for another time instead of losing it altogether. If you find you have lots of raw fruit and vegetable waste and can’t use the foods for quick soups or smoothies, then consider composting it. Havering Council have subsidised compost bins for residents and for just £14.99 including delivery, you can choose a 220L or 330L compost bin which comes with a free 5L kitchen caddy making it easy to collect food scraps from your kitchen and other compostable items from around your home and transfer it to the compost bin. Are you fed up with the way your area looks? Is there somewhere that needs tidying up, painting or where some bulbs or plants would make a big difference? That’s what Havering Council's Community Engagment Team are aiming to do with a series of community clean ups of the borough's housing estates starting with Oldchurch Gardens this Friday (17 March). and in Bevan Way and Hacton Lane, Hornchurch on Wednesday 31 May. All the sessions starts at 10am and we’re aiming to be finished by 1pm but you don’t need to be there the whole time, every hour you can spare will be put to good use so if you want to help out please let us know using the form on our website. If you've got items that you no longer need, think about passing them on to someone else instead of throwing them out. There are lots of reuse organisations that you can use to find your stuff a good home, including Havering Freegle, and the National Childbirth Trust's nearly new sales. See a list here. 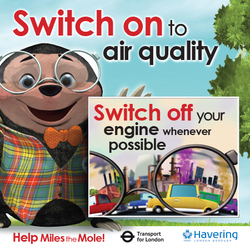 Miles the Mole says “do your share & help clear the air”! Air pollution in London is linked to almost 10,000 premature deaths a year. By turning off your engine whenever possible you can help us improve our air quality. This service is provided to you at no charge by London Borough of Havering.